The Star Falcon IV has carried over relatively unchanged from the Star Falcon III, with the differences so minimal that some Star Force pilots like to call it "Star Falcon 3L", the "L" standing for "Light". Indeed, the Star Falcon IV is lighter than the Star Falcon III, but not by all that much. The fourth Falcon does do without the ventral guns and the struts on top of the rudders, but aside from a little extra armor plating at the sides of the 360 degree bubble cockpit, the Falcon 4 is identical to the Falcon 3. The Star Falcon line of fighters has always been capable of warp, and the latest is no exception. Like the previous three Falcons, the Falcon 4 maintains the combination of firepower, speed, durability, and agility that the lineage has carried since its introduction so many years prior. 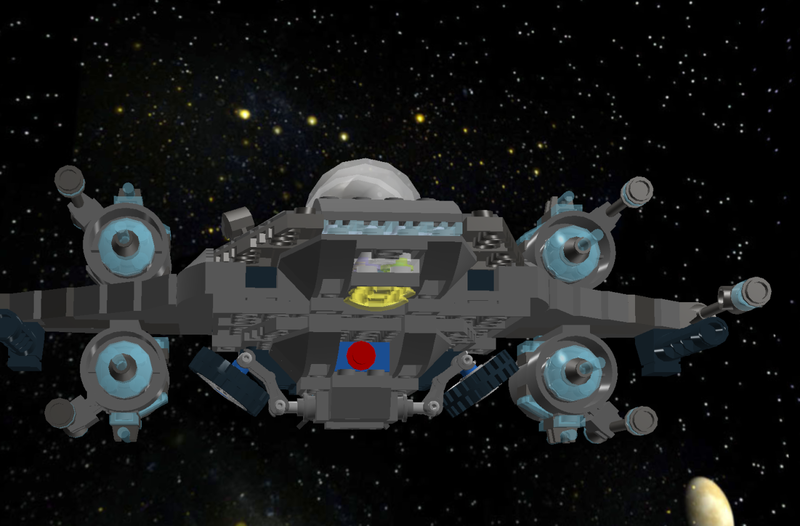 The Star Falcon IV is armed with six phaser cannons, two regenerative rocket launchers (which can also be armed with bombs), two mini pulverization cannons (high compression armor crushing weaponry), eight micro photon torpedo launchers, and a miniature version of the Waveripple cannon. For defenses it has ablative armor plating and a Federation shrink wrap particle + deflector shield generator. A maximum warp velocity of Warp 5 can be maintained until the fighter runs out of fuel or crashes into an asteroid, though the latter is highly unlikely because the computer system is programmed to utilize the deflector dish and automatically steer the fighter out of the course of danger. Remarkable piece of engineering. I believe I forgot to mention that the tactic of ramming starships, exiting the fighter, and going on rampages inside the starship is still plausible? 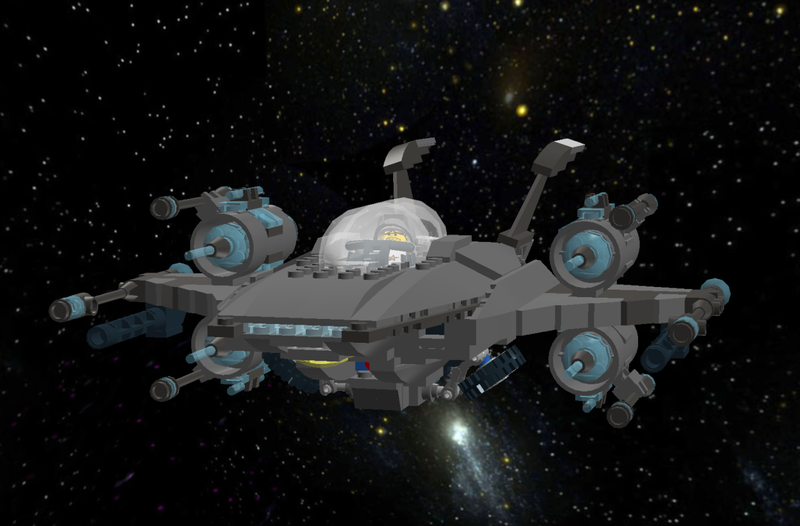 The fighter frame is simply a thing of beauty, but it has too many weapons and engines strapped to it, I suggest cutting the weapons down to two phaser cannons, one regenerative rocket launcher (which can also be armed with bombs), two micro photon torpedo launchers, and a miniature version of the Waveripple cannon on special forces fighters. Very nicely built for sure, but I agree with Dino on the weapons specs, it's pretty OP for a fighter, especialy a mid sized fighter. I have a mid/heavy fighter that probably only has half the weapons that this one does, LOL. One other thing, I assume that the wheels on the underside are some form of landing gear? That's the one feature I don't really like about the ship, it detracts from the smooth lines of this amazing fighter. Plus, in this timeframe, some form of skid would be more likely to have as landing gear, considering that most if not all vessels of this type are most likely VTOL. Aside from that, she's perfect, not exactly how I would have built her, but that's what makes it yours and not mine, right? Love the engine design/placement, BTW, I've always been a fan of placing the engines on the wing. Why is it, that in the entirety 3 year career of building Star Fighters, nobody ever likes the landing gear? Haha, thanks Dino and Johnnyred. 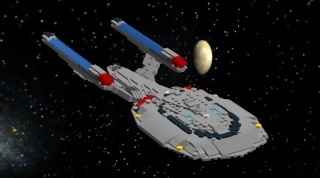 Yeah, it is quite OP, but that's the United States Air Force- errr, Star Fleet for you. It should be noted that the two larger phaser cannons are the main weapons, while the four smaller cannons do considerably less powerful but all together can put up some nice firepower. The regenerative rocket launchers take up a lot of energy and recharge time, and like Dino said, the Waveripple cannon is a special weapon, and takes up so much energy it can only be fired once, usually against starships. The yellow domes on the underside are repulsorlifts, so yes, the Grumman F6F Hellcat wheels (courtesy of SpitfireMad, thanks old friend ) are not the only form of landing gear this fighter has. As long as we're talking about fighters, I think I'll list the rest of the Star Force Air Force. :PThe majority are built by USFI (United Star Fighters Incorporated) and thus they steal most of the spotlight. Quite a hanger, and that's just fighters not counting most previous versions of the models and not counting any land forces, of which there is also quite a number. Star Force is no slacker. You MUST upload the rest. I really love your building. While I was never active while you were, I am familiar with your work and I really love it. Did I mention I love the engines? I'll be sure to make sure to ensure that happens. 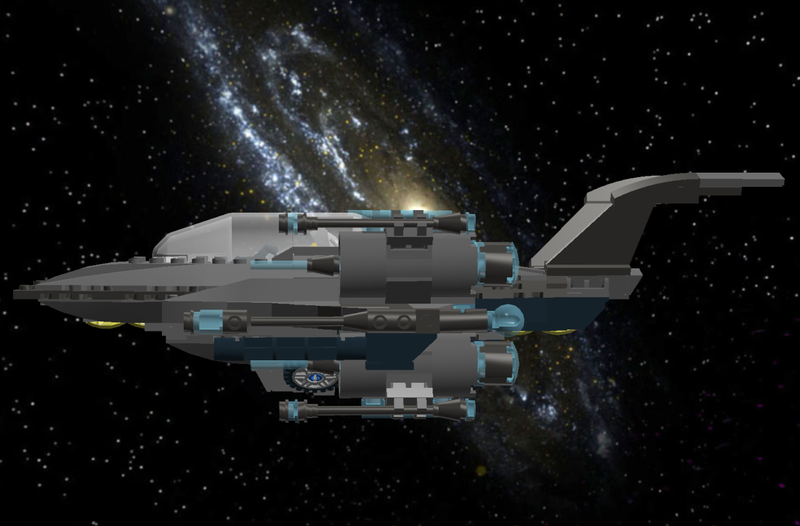 Long Answer: True, a large amount of guns can be quite overwhelming, but I feel it noteworthy enough that it should be noted to keep in mind that when building a Star Fighter, the picture I form in my head isn't just the base shape of the fighter. For me, the guns are a major part of what makes the shape of the fighter, especially wingtip guns, which I find to be very stylish and artistic. :)The engine mounted guns are for practicality (oh, the irony! Ikr! ) because in a galaxy where everyone is going to fight each other sometime or another, superior firepower is a must have. Short Answer: When I think of a fighter, I think of each and every gun as a major shape of what makes the fighter unique. The Star Falcon is no exception. Well, yes, I do admit that with later incarnations, I did go a bit overboard with weaponry, but the reason is stated in the Long Answer. @ Dino - Wouldn't the electrical systems also control the wheel type landing gear too? Talmid: While there are a lot more guns and engines than is practical, I will say this: that fighter just says "Why, yes, I'd love to utterly annhilate you, thank you for offering!" to me. It just looks awesome. Sorry, but I usually stink at coming up with adequate compliments. Jred: Wait...you're saying you don't like the landing gear...okay, now I'm confused! "No Better Friend, No Worse Enemy"
"Munit tome'tayl, skotah iisa." (Long memory, short fuse). Who said the landing gear didn't also have a manual release? @ARC2197: Thanks, but I like the idea of superior firepower and superior straight line acceleration and top speed. If I lose the drag race, I just shoot you down. Then again, I (supposedly) race fair, so whatever. Did I say I didn't like all the guns? I just said they weren't, ah, practical. No, no you didn't. I didn't mean to imply you didn't. Hmm, didn't it seem a bit like didn't was getting a bit redundant in that last line? I'll use isn't. It really isn't all that impractical when our galaxy is in a midst of turmoil. Impractical would be the Star Falcon III and the Star Phoenix III. They have so many guns that you can't fire all of them at the same time without choking the generators. I wont post pictures of those, but they're on the lab if you're really interesting. The benefit to the engine mounted light guns tho is that the engines also *somewhat* power them, so as long as the engines are running, there is no shortage to light phaser bursts stripping away more and more of enemy shielding. ...I'm gonna pretend I followed all of that. That's ok, now that I look at it again I can't either. Using the engines for power is a cool idea, but I think you would be able to set up a conduit between them and the guns. though it might cost a very little bit of power in between. Regardless of number of guns, it's YOUR fighter, and aesthetic/combat detail aside, it is an AWESOME one! It just looks SO aggressive and powerful. I'm glad I don't have these things shooting at me. You are good with Starfighters, Talmid! Wish I had found this before! Really like that side profile.